Represents clients throughout Washington, D.C., Maryland, and Virginia in the practice areas of personal injury, medical malpractice, business and commercial, wills and administration, appeals, and product liability. Kopstein & Associates, LLC is a proud personal injury and medical malpractice law firm. We litigate on behalf of our clients throughout Maryland, Virginia, and the District of Columbia. We are honored to bring claims on behalf of our clients against the negligent drivers, companies, and professionals who have injured them. We deal with all the major insurance companies, including Allstate, State Farm, Geico, USAA, Progressive, Nationwide, Liberty Mutual, Zurich, etc. In addition to personal injury and medical malpractice, we also represent clients in their business and commercial disputes, handle civil appeals, and prepare wills and other estate planning documents. Our firm is unique. It was founded over 40 years ago. 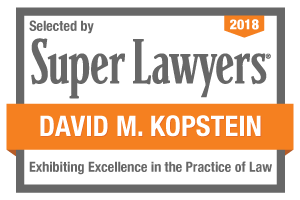 David Kopstein, our managing attorney, joined over 28 years ago. We continue to be successful because our attorneys and staff, most of whom have been with the firm for decades, work closely with our clients to achieve their goals. At Kopstein & Associates, LLC, we are committed to excellence in legal representation. We practice law with one thought in mind – the client comes first! Our law firm has been serving clients for more than 40 years. We have handled cases involving catastrophic personal injuries, medical malpractice, defective products, and complex business matters throughout Maryland, Virginia, and the District of Columbia. We often are called upon by other law firms to take over cases that are too difficult for less experienced attorneys. Ours is not a “volume” practice. Each client receives the individual attention that he/she deserves. Our clients are kept fully informed as their cases progress. Telephone calls are returned promptly and questions are answered in plain English.